“There is a difference between a map and an app. We don’t develop the app. We license the map data, which is like a foundation. The customer can build on top of that, but we license the same mapping data to all our customers,” said TomTom media manager Cem Cohen. I had my first real run-in with a glitch in Apple Maps this past weekend, and I decided to try to follow back the trail of data to figure out where it comes from. The verdict: it’s TomTom’s fault. Here’s what happened: we were attending a surprise anniversary party for some close family friends, and we needed to arrive at the restaurant well ahead of the guests of honor. 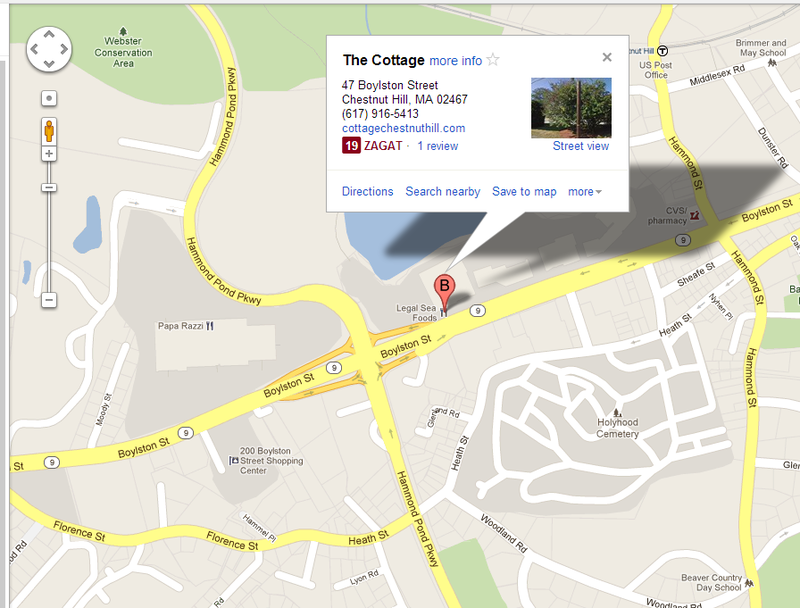 I looked up the address for the restaurant (The Cottage in Newton, MA) on my phone, and it showed that it was in the Chestnut Hill Mall. The Chestnut Hill mall is a relatively upscale shopping center with several restaurants (and an Apple store! ), so I wasn’t surprised that the restaurant was in there. I already knew how to get to the mall, so I just drove to the location from memory. We got a little bit of a late start, but I knew where I was going and was confident we would still get there in time. As we pulled in to the mall, I decided to take a swing by one side of the mall where I expected the restaurant to be before parking… only none of the restaurants was The Cottage. So, I drove around to the far side of the mall, and it wasn’t there either. About this time, my wife’s aunt called to ask where the heck we were. We explained that we were at the mall, trying to find the restaurant, and she informed us that we were in the wrong place. The restaurant was in the “Lower Mall”, which is on the other side of the parkway. We were close, but still another 5 minutes of driving away. 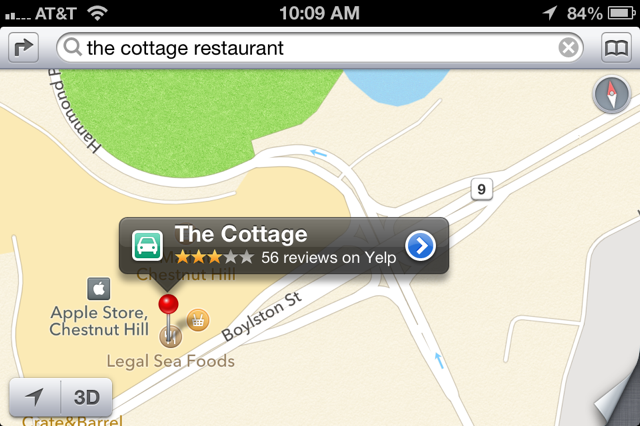 Yes, I had found my first Apple Maps bug. In general, I had felt that people were over-blowing the problems with Apple Maps, and the 3D flyovers are absolutely stunning. However, faced with almost ruining a surprise party, I did find myself grumbling a bit. My wife was none too pleased either. I decided to dig a little deeper about where the problems come from. It’s been reported that Apple has more than 20 separate data providers and that the problems are mostly with points-of-interest locations. Was this a problem with TomTom, or some other provider? It occurred to me that I had a way to answer. Long before Apple rolled out turn-by-turn directions with iOS6, I had bought TomTom’s GPS application. This would be data that was exclusively from TomTom, and it was an application written by TomTom. If there was a problem, there was no one else to blame. Sure enough, TomTom put it in the same location that Apple did – “Upper Mall”. 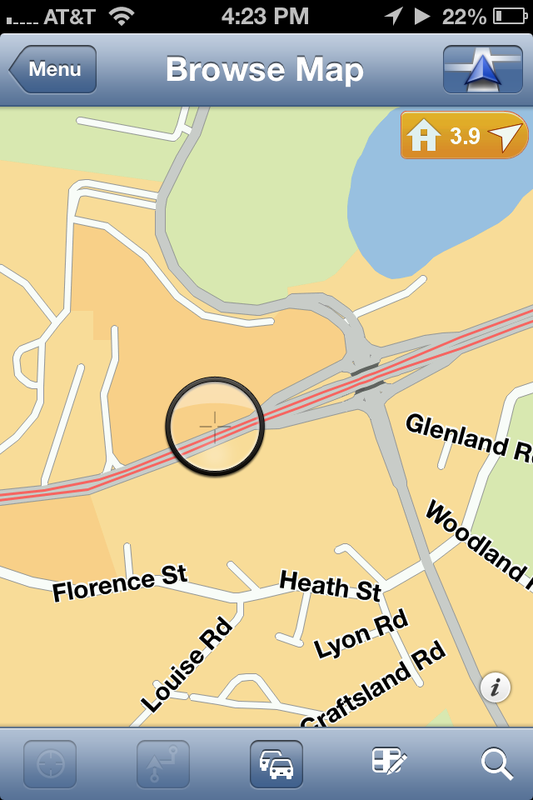 This is an error in TomTom’s data, not in Apple’s implementation. This entry was posted in Uncategorized and tagged family, iOS, iPhone, location services, mobile, travel. Bookmark the permalink. Are you looking to become Sherlock Holmes, Jer? Very interesting find.